Character roll-ups sandwiches are fun to create and it's not as difficult as you might think. You'll get into it after creating the first one, in my case it was bear rolls-ups, then bunnies and so on. First, I flattened the bread slightly with a rolling pin (you can skip this step if you prefer), add the sandwich fillings and roll. 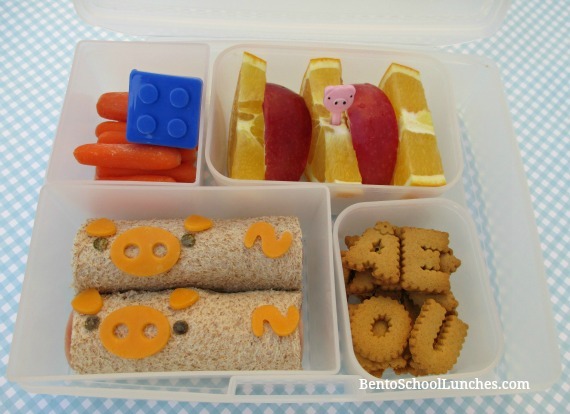 Place the sandwiches in a lunch box and get ready for the facial accents which is the fun part! I created the pig's snouts and ears for these sandwiches using my CuteZCute animal friends cutter. The tails were made with the letter S from my alphabet cookie cutter set and the eyes were nori cut with my hole paper puncher. Bottom left: Piggy roll-ups sandwiches. Bottom right: Alphabet wheat cookies from Ikea. Top left: Organic baby carrots and dip in the blue Lego container. Top right: Orange and apple slices with a pick. Oooh I'll love to try this piggy roll up! Such a cute lunchbox addition! Love this, so very adorable!